In our previous two tutorials we discussed How to Get Started with PIC using MPLABX and XC8 compiler, we have also made our First LED Blinking Program with PIC and verified it by simulation. Now it's time for us to get our hands on to the hardware. 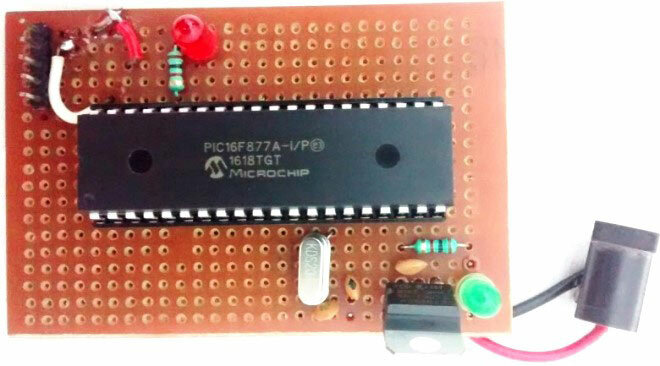 In this tutorial we will build a small circuit on a Perf Board for Blinking the LED using PIC. We will dump the program to our PIC microcontroller and verify the LED Blinking. To Program the PIC MCU we will be using MPLAB IPE. 33pf Capacitor - 2Nos, 100uf and 10uf cap. What happens when we "Burn" a Microcontroller!! It is a usual practise to upload the code into a MCU and get it working inside the MCU. But what really happens inside the MCU how does few lines of C-Program get into a silicon chip and gets executed? There are ways on how to read this and how to understand and reverse it back into Assembly language, but it is completely out of scope of this tutorial. So, to simply put it into a nutshell; the HEX is the final software outcome of our coding and this is what will be sent to out by MPLAB IPE for burning the MCU. Since we have just compiled a small LED blinking program, the memory summary shows that we have just consumed 0.5% of the available program space and 1.4% of Data space. Program Memory: This memory contains the program (which we had written), after we've burned it. As a reminder, Program Counter executes commands stored in the program memory, one after the other. Since we have written a very small program, we have consumed only 0.5% of the total space. This is a non-Volatile memory, means the stored data won’t be lost after the power off. Data Memory: This is RAM memory type, which contains a special registers like SFR (Special Function Register) that includes Watchdog timer, Brown out Reset etc. and GPR (General Purpose Register) that includes TRIS and PORT etc. The variables that are stored in the Data Memory during the program are deleted after we turn off the MCU. Any variable declared in the program will be inside the Data memory. This is also a volatile memory. Data EEPROM (Electrically Erasable Programmable Read-Only Memory): A memory that allows storing the variables as a result of burning the written program. For example if we assign a variable "a" to save a value of 5 in it and store it in the EEPROM this data will not be lost even if the Power is turned OFF. This is a non-Volatile memory. Program Memory and EEPROM are non-volatile memories, and called as Flash Memory or EEPROM. We will be programming our PIC16F877A using the ICSP option that is available in our MCU. ICSP is suitable for all PIC packages; all we need is to pull out these five pins (6th pin PGM is optional) from the MCU to Pickit3 as shown in the picture below. In the above circuit I have used a 7805 to regulate the output 5V to my PIC MCU. This regulator will be powered by a 12V wall mart adapter. The RED Led is used to indicate if the PIC is powered. The connector J1 is used for ICSP programming. The pins are connected as discussed in the above table. The first pin MCLR must be held high with help of a 10k by default. This will prevent the MCU from resetting. In order to reset the MCU the pin MCLR must be held to ground which can be done with the help of switch SW1. The LED is connected to the pin RB3 through a resistor of value 560 ohms (See LED resistor calculator). If everything is proper once our program is uploaded this LED should blink based on the program. Whole circuit is built on Perfboard by soldering all the components on it as you can see in the image at the top. Connect one end of your PicKit 3 to your PC and other end to your ICSP pins on perf board. Connect to your PIC device by clicking on the connect button. Browse for the Blink HEX file and click on Program. If, everything goes as planned you should get the success message on the screen. Check the Code and Video below for Full demonstration and use the comment section if you have any doubt. Let’s meet in the Next tutorial where we will play with more LED's and a switch. TRISB=0X00; //Instruct the MCU that the PORTB pins are used as Output. Excellent tutorial, thank you so much , made my learning easy . Expecting more advanced lessons from you . Currently there are about 15 tutorials for the PIC MCU. Learn all them to enhance advanced skills. It was great and very much helpful for beginners, but can you elaborate on the selection of hardware like why 1nF capacitor is only used? thank you very much for such a good tutorial .I would like to the use pickit3 and oscillator. I have followed your tutorials on pic controller and am trying to use them in my project. I have tried to test my controller with the LED blinking program. I have used a dumping kit in our lab to dump the program, but not picKit 3. And i have built the circuit . But its not working, the LED is not blinking. What could be the possible reason for its failure? There was no problem while dumping the code! Your tutorials are very informative and helpful in my project. But am using a dumping kit in our lab. Though the code is being successfully dumped, the circuit is not producing the output even for the simple LED blinking program.What could be the possible reason for it? Do we have to use only pickit3 for dumping? No you can use any kit to dumb the program. Are you sure the program is uploaded successfuy? Did you use the same program? I have used the same program. But the led is glows and never Blink. Did your simulation work? Have you connected it to the same pin>?